I was lucky enough to have my sister Kathy ("Miss KO" of the Chicago Roller Derby scene) visiting for Thanksgiving with her husband Jim and their sons. The Chicago branch of the Oslers are Unitarian-Universalists, and particularly observant ones, too-- they are very involved and active in their UU fellowship. Obviously, we don't share the same religious views, but have learned a lot from one another over the years. This holiday, though, it was Kathy and Jim who made things much more meaningful and spiritual for me. We made a big turkey and when it came out of the oven there was still a lot to do-- the table wasn't ready yet, the turkey had to be carved... but suddenly my brother-in-law turned on the music, and a half-hour of kitchen-dancing broke out, adults and children together. It really wasn't part of the plan, but it became completely infectious and joy-filled. There was something about that which opened my heart to true, gut-wrenching thankfulness, the kind of thankfulness where I was profoundly impressed with how undeserved my abundance probably is. In prayer, I felt the spirit of the moment and God in a way which I too rarely experience, and was close to crying. That is my favorite kind of surprise. The events in Mumbai over the past few days have been just horrible. I can't say I understand it all, but it seems that the theory behind it was to harm Americans and Jews. What is the gain in acting out of retributive hatred? In what way does that advance any goal, even an illegitimate one? Our federal government is clearly in "bailout" mode. Personally, I'm against the bailouts, but it looks like they are going to happen. Given that, the government has two choices-- give the bundle of cash to those at the top (who run the failing companies), or to those at the bottom. For example, with the auto industry we could either (1) give $25 billion to the company management, or (2) give the $25 million to Americans to buy US-built cars. For example, you could offer a $7,000 tax credit to people for buying a fuel-efficient American car. I prefer the latter. Consider this-- if you give the money to the consumers, they will buy cars, and the companies will continue to compete to fulfill that demand. This bailout would reward a specific skill set in company management-- the ability to build cars people would buy. If, on the other hand, you give our tax money straight to management (as a loan or a grant), they will use that money for other things that will produce a much shorter-term gain. We have seen this already, as the bailout money to banks has largely gone towards their acquisition of other banks, not loans. As you probably heard, shoppers in New York busted down the doors of a Wal-Mart and trampled to death the employee who was opening those doors. Ugh. I hope everyone had a great Thanksgiving. It was an excellent holiday here, even though the turkey turned out a little dry. I blamed the economy for that, though, and am expecting a government bailout now. Today may be the best day of the year to reflect on food, so let's do that, shall we? As many of you know, in the recent election I voted for Argbf, hoping that he was the one who would finally be able to get a handle on the violence in the Panda community. Apparently, the Argbf administration has some work to do. 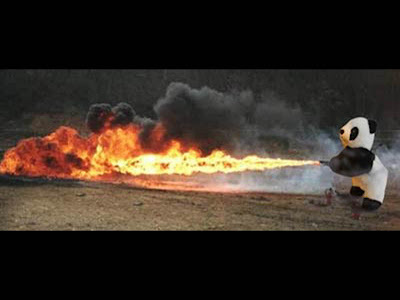 Perhaps, in retrospect, I should have voted for Grar, the Giant Maverick Panda. Thanksgiving is my favorite holiday. I like the fact that, other than the turkey industry, there is no one commercializing the holiday. I love the meaning of the holiday even more-- the idea of giving thanks for what it is we have. Some thank God, some give thanks those around them, many consider both, and all are wonderful expressions. I'm thankful for many people, but I will recognize only a few here. 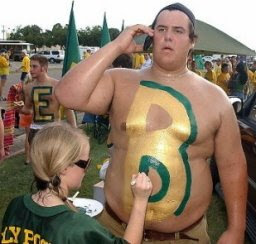 I'm very appreciative of those who have the least heralded positions at Baylor Law. As I've noted before, when I need a pick-me-up, nothing works quite like one of Maria's burritos. It's not just the food, either; when I am there I also listen to her talk to my students, with a knowing and understanding voice. There are also Jimmy, Nancy, and the other people who clean the law school. I can't tell you how many times I have left the school late in the evening and come across Jimmy deep in conversation with a student, nodding with compassion. At first I was shocked that so many of the students knew the custodian so well, but over time I grew to appreciate what a good thing it is. For some of our students, it might have been one of the best things about law school. I am lucky to have such colleagues. Of course, I have already issued my rant on that particular pardon. Citigroup, which has suffered from some pretty bad management, is getting bailed out again. They had already gotten $25 billion from the government under the bailout plan. For those of you who have missed it, the first round of bailouts went like this: Instead of buying up toxic assets as planned, the government just gave the banks big wads of our money. The idea was that if Bush/Paulson/Pelosi gave them lots of taxpayer money, they would make more loans. Of course, the Bush Administration (the sole administrator of the funds) didn't actually require that the banks, you know, make loans-- they just gave them our money, in huge amounts. Not surprisingly, the banks in large part are just keeping the money or using it for other things rather than making loans with it. Sigh. Bank of America took billions of our tax funds, for example. Did they then make loans at a more rapid rate? Nope. Instead, they spent $7 billion to buy a stake in a Chinese bank. Yep-- we give tax money to the bank, they invest in China. Good work, people! Remember when Ronald Reagan attacked welfare because it gave people small amounts of money while requiring no accountability? Most people, in retrospect, think the reforms he and Clinton made were probably good moves in many ways. Apparently, though, we still think it is ok to give away gigantic amounts of money to irresponsible corporations without requiring any accountability. Meanwhile, the automakers are figuring that if the banks can get our money without making loans, they should be able to get our cash without selling us a car. Their plan? 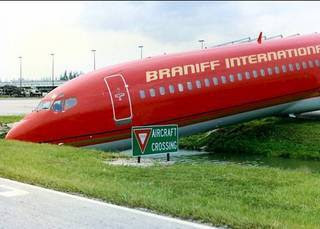 In what seems like an idiotic passive-aggressive reaction to the criticism of their fancy private jet travel last week, the auto executives are going to return to DC in a carpool. Postive Review for Chinese Legal System! For the past month or so, I have been learning Kung Fu at a wonderful local place (great teachers) which follows the seven-star mantis style. My classes are taken in a group of 6-12, which is mostly adults with a few kids mixed in. Twice a week in class we begin and end each class by arranging ourselves in order of our experience and proficiency in Kung Fu. Because I am the least proficient and newest student, I am the last in line. In front of me in superior positions are several Baylor undergrads, an eleven-year-old boy and a very young girl. There is something about this that I find deeply moving and important-- to be not only a follower, but the least of all those in the room. Our society places a great value on leadership, but I practice a faith in which following is extremely important. Yes, some are called to lead in a church, but ALL are called to follow the lead of Christ. This following is at the core of the Christian experience; the teachings of Christ are to be given primacy even when they require great sacrifice or are contrary to what society directs. I work hard to be a good follower, but I am deeply flawed at times. Because I view faith this way, I decided several years ago to have parts of my life where I can practice following skills (which, to a Christian, may be more important than leadership skills). In my church, I have sought no leadership role, and am very conscious of the fact that among the many serious theologians that surround me there, I am one of the less learned people in the congregation. There are other settings, too (like the Kung Fu class) where I am conscious of being in the role of follower, and focus on doing that well. When I say that I believe in being a follower, I do not mean blindly following an individual; rather, within my faith it means that I do not let my own thoughts outweigh the teachings of Christ. In secular settings, it means that I must recognize that there are others more knowledgeable than I am in that place. 1) One must carefully pick the settings in which one will be a conscious follower. For example, you must pick a church where you trust the wisdom of the discourse there. It is crucial to discern and critically evaluate the place where you will be a follower. 2) As a follower, you do have a voice. However, at many times you must learn to still that voice and consider the wisdom of others. If many people disagree with you, it may be that you are wrong in whole or in part. 3) Once you have listened with humility, a follower retains the ability to disagree. However, there are times you must accept that your view will not win out. There is a lot in our society that celebrates and rewards those identified as leaders, sometimes even when they are not very good leaders. Perhaps we too often see leadership as always preferable, when for many of us, including me, our true role in some settings is to stand in the least honored position, to learn and to grow. It's the Saturday before Thanksgiving, which can only mean one thing-- the Harvard/Yale game! Can't you feel the excitement building? Huh? Can't you? Of course you can't. Only .001% of the population cares even remotely about the Harvard/Yale game. And some of those who care are engaged only because it seems kind of repulsive-- the Nerd Bowl. People who are either big or fast, after all, go to real football schools. On top of that, you have the images of people in fur coats sipping port, or perhaps the ridiculous and nerdy stunts pulled by students. Jan. 20, 2009, will be a historic day. Barack Obama (Columbia, Harvard Law) will take the oath of office as his wife, Michelle (Princeton, Harvard Law), looks on proudly. Nearby, his foreign policy advisers will stand beaming, including perhaps Hillary Clinton (Wellesley, Yale Law), and Jim Steinberg (Harvard, Yale Law). This group is, as Brooks puts it, "that slice of America that got double 800s on their SAT's." He means this in a good way, actually, and Brooks concludes that the group chosen for the Obama administration so far are open-minded, admired in their fields, non-ideological, creative, and (with the exception of Clinton) not excessively partisan. I'm not as confident as Brooks. Smart people often do dumb things. Still though... last night I turned on the television and happened to see Lawrence Lessig being interviewed on PBS. Lessig was a year ahead of me in law school, and we thought he was the smartest guy in the school. We were probably right, I realized, listening to him make sense last night. 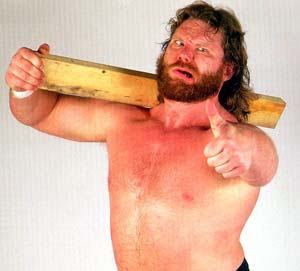 He didn't fall in a well or sing in his underwear to get famous-- he had some great ideas. He is famous for his intellect. That Yale Law nurtured that, and surrounded him with teachers and students who challenged him and admired his talents, nerdy as they might have been... that was a great thing, and we are all better off that Lessig and Obama, Clinton and Holder, Plimpton and Buckley, are or were prominent in our society. What remains to be seen is if they can run a government. Yesterday, among many other things (and where else but the Razor can you find such articulate socialist v. capitalist shoot-outs? ), we were discussing the relative merits of the Kinks vs. The Who. They're both good, so it was an excellent choice, but today let's look at the other side of the record. There has been some truly horrendous music made. Some of it, in fact, is verrrry popular, too. So today's theme is bad music, which you can interpret either as music that is poorly played, mind-numbing, or just plain old annoying. Yesterday morning, I gave a lecture to the federal defense panel in San Antonio. My hotel offered a free USA Today, and when I opened it, it fell to a full-page ad from GM explaining how they needed tax money NOW, and how it wasn't at all their fault that they are in this situation. It also acknowledged the top executives would get no bonuses this year... like that's a concession? Was there some conceivable way that running the company into liquidation might possibly merit a bonus in the first place? Ugh. OK, guys-- if you are so desperate that you need our money while millions lose their homes, how is it that you can buy a full-page ad in the paper; an ad which isn't even trying to sell a car? Are you hoping that perhaps I will read your ad and think "Gosh! Poor GM! I'll just send them some cash!" Or is it just... the way you are used to doing things? To go plead for tax money-- the money the government takes out of the pay of working people every month-- the executives for GM flew in on their super-expensive private jet. Then they flew out again once their shameless task was through. GM executives never, ever, take responsibility for anything, it seems. They never developed a good small car. They never dealt with their bloated dealer network. They never took advantage of what the Saturn division offered to the rest of the company. The squandered the EV1 concept when they couldn't get more federal tax money for it, and now would sure be a great time to have an electric car. Yet, of course, it is not their fault. Of course, even the outrageous cost of their flying is a small fraction of the huge amount of tax money they want. Still, this episode once again shows you the decision-making skills of these guys, and, well, if that's not enough, go rent a Chevy Cobalt. It speaks for itself. Though GM is not bankrupt yet, it is not too early to say that those executives are morally bankrupt, as they ask for the money of working people, then fly away in their Gulfstreams. Here is the picture I ended up with for the book jacket. 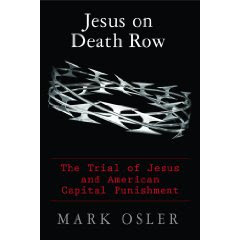 It's pretty stern, but... it is a book about the death penalty. It's also not so flattering, but there's not much I can do about that. Hopefully, though, it will intimidate Prof. Serr in advance of our debate tonight. Serr (shown in the video below, which he made for last year's debate) is arguing for the petition that the government can torture anyone they want for any reason. I will be holding for some kind of reasonable limits on the horrific festival of torture he wants to initiate. Details: Tonight, 7 pm, first floor of the law school. It sounds like things are going well for GED3! 1) He got to argue his first sentencing-- his first chance to make an appearance on behalf of the United States. 2) He also got to tour the border in a Blackhawk helicopter. Yow! 3) He has also been issued a flamethrower, and is learning how to use it. kd lang and Elton John, sure. Melissa Etheridge, uh, yes. But Ted Nugent, because of the loincloth? George Michael, because he is Texan? What's up with that? At any rate, the full rant is worth a look. Yesterday, I was over at Barnes and Nobles and noticed a bunch of chairs set up. 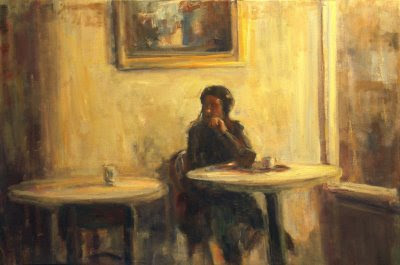 As I often do in those situations, I sat down in one to see what would happen. Almost all the other people sitting there were elementary school kids. After a while, an older man with white hair came to the front of the room. The parents murmured and there was that sense of excitement that the kids picked up on, even if they didn't know why. I didn't know the man, but for whatever reason he walked over to me and shook my hand, and then another man's, and then he started to speak. 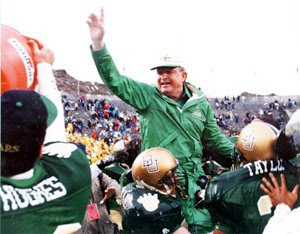 I may have been the only person in Waco never to have heard Grant Teaff speak. It was fascinating, though. He talked to the kids like they were adults, but with a message they would understand. There was not a hint of condescension in what he said, but great conviction. Like most good speakers, his basic message was simple but sharp: He told the kids they needed to have balance in their lives. He got to this by asking them how many of them watched lots of tv. It was surprising how excitedly many of the kids responded to this, yelling out how many hours of television they watch. They seemed to think that Grant Teaff was going to tell them to watch lots of television. In the end, he told them that the amount of tv they watch should be no more than the amount each day that they spend reading and playing outside. It made a lot of sense, and it made me think about the balance in my own life. What part of the equation is missing? I suspect that I am a little out of balance these days, and it is not from watching too much television. I read that and think, "this is silly. These people just made this stuff up." And seriously, I'm pretty sure they did. However, it would be dishonest not to recognize that people say the same thing about my own faith, Christianity. They contend that Jesus' life cannot be historically verified, that objectively it seems bizarre to ritually drink symbolic (or, for Catholics, what is perceived as actual) blood, and that Christianity has led the world to war and oppression. I'm not quite sure how to answer that. It doesn't make sense to thrust a Bible at them and say "read this!" 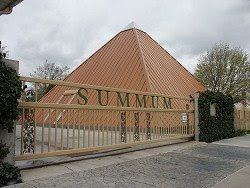 any more than it would be affective for a follower of Summum to show me their pyramid. Out of context, it does seem odd to symbolically drink blood. I can't pull out some independent verification of Jesus' life that would be acceptable to such skeptics, either (though I think there is a historical record). I suppose that recognizing that I can't prove the truth of my faith to others in an objective manner might lead to doubts in my own mind, but it doesn't. For me, it starts with the gospel message, the teachings of Christ. That is what matters most to me, what feels truer than true to me, and it is those teachings that challenge me every day. I really don't need miracles or proofs to know how much I need those constant lessons to live a life of humility, benevolence, and freedom from hypocrisy, and how well-formed they are for me and my society. Can I convince others that way- by telling them that those counter-cultural teachings ring with truth to me? Probably not. But, it does make me immune from the lure of Summum, and also from the loss of faith that might come from the realization that an objective view might not reveal the truths that I feel. What? No jumbo shrimp at the party? And I'm fired? It appears that things are a little down at White and Case, a New York law firm. The Christmas party isn't going to have fireworks this year. Oh, and they had to law off 70 lawyers and 100 staff people. Things are getting more difficult out there in the practice of civil law. I have heard of cutbacks almost everywhere. For what it is worth, though, jobs are still there in criminal law. If states get into serious financial trouble, there might be some affect, but it is rare to cut deeply into the ranks of prosecutors, and defense attorneys are always going to be needed (much as states may try to squeeze them). In fact, I have been looking for a tightening in the criminal law job market, and haven't seen it yet. Interesting... and encouraging, for those of my students who are going out into that market in the near future. First of all, yesterday's Sentencing class was a lot of fun. I can tell already I am going to enjoy that class (Appeals and Habeas is harder to judge, since it meets at 4 am or something). Of course, sentencing is something I understand. There are a lot of things I don't understand at all, however. For example-- what is the deal with Mickey Mouse, Goofy, and Pluto? Mickey, a rodent, has a pet dog (Pluto). That's pretty strange in and of itself. On top of that, however, Mickey also has a friend who is a dog, Goofy. How does that work? How can an animal own another, larger animal as a pet? And doesn't Pluto have a problem with this? Urgh. These are unanswerable questions, I fear. So let's just create haiku, instead. Social movements that relied mainly on political power to enforce a conservative moral code weren't anywhere near as successful as those that focused on changing hearts. I think that you could take the word "conservative" out of that statement and it would still be true. It is because I believe in this thought that I wrote the book that I did. However, what about Proposition 8 in California, which changed the California Constitution to prevent gay marriage? Did advocates for that measure change hearts? Now, everyone wants a bailout. Auto companies certainly do, American Express changed its corporate structure so that it can get some of your tax money, and others are jumping on board. The financial institutions that have gotten tax money so far have used it for executive bonuses, mergers, and to pay dividends. Does anyone care anymore? Should we? Ever thought about becoming a PD in Arizona? We start attorneys at close to $58k, great benefits, and up to $500/month in loan repayment. For several months, I have been checking in on Between Sundays, the blog maintained by the pastor of Southland Baptist Church in San Angelo, Texas. That pastor, Taylor Sandlin, is an excellent writer and an insightful Christian. 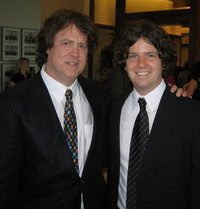 So today, after several months of reading the blog, I stumbled across a comment on "Between Sundays" (from August 20) that revealed that Taylor Sandlin is actually the brother of my former student/lookalike, Erick Sandlin. Who knew? I mean, besides the Sandlins and everyone who knows them, except me? Right now I am sporting crazy-hair, one of the things I often had in common with Erick. However, I am getting a photo taken on Thursday (for the book), and am wondering if I should (1) Keep the hair as is; (2) Let Judge Manske cut it again, or (3) Actually pay a professional. What do you think? Tomorrow night, I will be on a panel sponsored by Alpha Phi Alpha, discussing what will happen with the Obama administration coming to Washington. It's a fascinating topic because there are going to be many changes, as promised during the campaign. The other panelists are Baylor professors James SoRelle (History), Joseph Brown (Political Science), Stephen Gardner (Economics). The forum starts at 7:30 in the Keyser Auditorium in the business school, which is next to Morrison Hall on Baylor's main campus. On Sunday, the New York Times reported the news that public defenders in 7 states are so overwhelmed they are not taking some cases. The fact that defender budgets are cut at the same time as caseload goes up is creating a crisis. Any practicing attorney can tell you that it takes time to handle any case well. These caseloads are making good or even adequate representation difficult to impossible. For those of you who may have missed it, here is Van Darden's story in the Waco Trib about commencement on Saturday. (On Saturday morning, the Trib also ran a guest editorial based on a prior Razor post). And now, off to a new quarter! Some of you may remember the continuing saga of American Violet, the film which chronicles a case I worked on several years ago, and which largely focuses on the efforts of my former student, David Moore. I got to see the movie last month, and not only was it wonderful, but it portrays Baylor Law in a very favorable light. (The guy playing me wears a bolo tie and seems to be a good dancer, but I'm ok with those inaccuracies). Last week, the film was picked up for distribution by Samuel Goldwyn Films. Given that it is a film about race and justice, I'm not surprised that this deal was completed just after the election. What this means is that the movie will make it out into theaters sometime in March. As I have said before, what David did is a great story that deserves to be told, and the filmmakers did a great job with it. It was quite a week at Baylor. As almost everyone already knows, there were some very troubling incidents on campus this week after the presidential election. A noose in a tree, confrontations between black and white students; and perhaps more. In the national press, accounts of these incidents were careful to note Baylor's religious affiliation. Some think this is unfair, but I do not. Baylor promotes itself, ceaselessly but properly, as a Christian, Baptist University. If we do that, we also should expect high expectations for how we conduct ourselves and what kind of culture we have on campus. It is unacceptable to have a culture that can include a noose hanging from a tree on Tuesday night. Such a culture is not Christian, it is the antithesis. Such behavior must be condemned not only as inappropriate, but, at a school like Baylor, as fundamentally wrong by any sense of religious faith. Still, there is hope. We graduated 16 students yesterday. They were addressed by William Sessions, a Baylor Law alum and former US Attorney, federal judge, and director of the FBI. His message did not directly address these incidents, but the values he promoted from the stage made it clear that the mandate for these students must include public service. That service, of course, can be what changes a culture. These students will be leaders, and the challenge to be moral leaders is not only important but necessary in a world still in crisis. Among the many other things he represents, Barack Obama's victory in the presidential race makes him the second among the last three presidents whose occupation outside of politics was teaching in law school. As laid out in the New York TImes, President-elect Obama was an outstanding teacher for twelve years at the University of Chicago's law school. He was good enough, in fact, to have been offered tenure without having published (an offer he declined). He was also an anamoly on the faculty; a liberal amongst a largely conservative faculty. But, importantly, he was a lecturer. I would like to think that his election sends an important message about non-tenure track faculty; about what they have to offer and the relevance of their thoughts. They often are more political than us tenured profs, or more "practical," and that is sometimes thought of as a bad thing. This lecturer, though, is now about to author the most relevant scholarship any of us will ever see, in the form of his presidency. Perhaps, behind everything else that his Barack Obama means to different people, his election will open our eyes in this way, too. Hey, now! That's some real change! As some of you know, I have been working for many years on the crack/powder disparity in the sentencing guidelines, which much more harshly sentences someone possessing a given amount of crack cocaine relative to someone else who is possessing the same amount of powder cocaine. Those efforts have included writing articles both long and short, testifying before the sentencing commission, having a newspaper debate on the issue with Attorney General Mukasey, giving lectures in unusual places and working on appeals in the First, Second, Third, Fifth, Eighth, and Ninth Circuits and in the Supreme Court (in fact, I spent this week working with Dustin Benham on our reply brief on the cert. petition in Spears II). Over the last several months, I have even done some seemingly ineffective lobbying on the issue, including funneling information and arguments to the Obama campaign via a friend with access there. No doubt, they were hearing the same thing from others. Obama and Biden believe the disparity between sentencing crack and powder-based cocaine is wrong and should be completely eliminated. It's hard not to feel good today, though I would note that Doug Berman, who knows an awful lot about this stuff, is much less hopeful than I am, and suspects that "entrenched interests" will block this kind of change. Tomorrow, when finals are over, everyone is officially allowed to get sick. 10) Christmas stuff in the stores already? Even more exciting than Guns' n' Roses' long awaited "Chinese Democracy" album.... the syllabi for my Winter Quarter Sentencing and Appeals n' Habeas classes are available up on the 3rd floor in the boxes by the stairs. 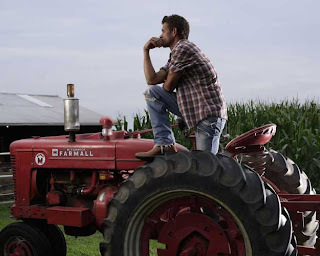 I had a piece all written for today's post, but when I read the Farmer's post over at his own blog, The Bosque Boys, I simply stole it and pasted it in below. We obviously have deep disagreement over politics, but share a love for this country, its history, and what it represents. His piece is better written than what I had prepared, represents a different perspective, and is fair, wise, and gracious. I hope you enjoy it as much as I did. "Congratulations to President-elect Barack Obama, who ran the best campaign of my lifetime--possibly the best campaign ever. Why did we lose this election? Number One Reason: because we deserved to. Our only argument was that the other guys were going to be even more disastrous than we had been. True enough, perhaps, but not compelling. As a tribe, we conservatives believe in consequences for bad decisions and poor performance. We failed miserably in our attempt to right this country. It is time to take our medicine. It is time to rebuild on a solid foundation of fundamental principles. On the other hand, I wish Barack Obama success, for his success will be my success. In truth, we know almost nothing about him. Four years ago he was an obscure state senator--and he is not naturally forthcoming about his history or his philosophy. Nevertheless, my sense (i.e. fervent prayer) is that he is an intelligent fellow and a good man. Let's hope for the best. What are my realistic but optimistic expectations for an Obama presidency? 1. I hope that Obama will be a healer and a pragmatist. 2. I hope Obama completes the mission in Iraq regardless of where the credit for success may fall. If the president-elect decides to retain Robert Gates as Secretary of Defense, and David Petraeus as commander of Cent-Com, and allows them to back us out of Iraq in a responsible fashion, he will have my undying gratitude for the duration of his administration. 3. I hope the new president will address the long-term realities of spending and taxes and what is possible and sustainable (as opposed to banal Democratic Party talking points). 4. I hope the new president will address our long-term liabilities regarding education (as opposed to banal Democratic Party talking points). 5. I hope the president will address our long-term energy needs in a pragmatic way (as opposed to banal Democratic Party talking points). 1. Realize that much more is at stake over the next few months and years than partisan victory. 2. Realize that the success of the next president is inextricably linked to our success as a nation in a moment in which we cannot afford to fail as a nation. 3. Support my president wholeheartedly on January 21st. Of course, I will continue to advocate for my core principles, which are the same now as they have been for all of my adult life. However, I will do nothing to tear down this president. I will do all I can to guard against character assassination and Obama Derangement Syndrome. If he succeeds grandly, we win as a nation. If he falls short, we will be back in time to offer another option--and maybe we will be better equipped to live up to our own ideals then. May God Bless this President. May God Bless America." Osler here again. I realize that I am probably violating some kind of copyright law here, but if there's trouble, I know an IPLawGuy who will have my back. If you enjoyed this stolen post, you might also enjoy Justin's fine work over at Running Down a Dream. Barack Obama will be sworn in as president of the United States in January. To get there, he had to defeat a remarkable man, Sen. John McCain. Some of my best friends supported McCain, and for the right reasons-- because they believed in the good and true principles that McCain expressed, and believed, correctly, that he had the experience and judgment to be a strong president. Among the many decent things about the John McCain, it was remarkable that he refrained, out of a sense of fairness and decency, from attacking the former pastor of Barack Obama's church. McCain valued some things more than being elected, and that is America at its best. As set out in the preceding post, I voted for Barack Obama because I supported his view on issues I care most about. I did not vote for him (or against him) because of race. However, now that he has been elected, we must recognize the moment that this is in our nation's history. It is a remarkable night, and a victory for the American people, white and black, Republican and Democrat. A black man will be president of the United States, and it is not because he is black-- it is because of the "content of his character," as another man standing on the steps of the Lincoln Monument forty-five years ago said to a crowd who may have considered it a ridiculous dream. My first memory is of my city burning. (My family lived in the City of Detroit at the time; we moved to Grosse Pointe after, and because of, the riots). I was four years old when Detroit was burned from the inside out. The National Guard occupied my home town, and there were tanks, tanks in the streets. I remember the smell of the oily smoke. That is how bad the issues of race were when I was a child. And now, we have come to this. Whether you voted for Sen. Obama or not, I hope you will take some joy in the fact that our nation, in my lifetime, has come in some small way to fulfill the dream that Dr. King described in a troubled and dangerous time. America is a great country, and it is ours, all of ours. Over the months to come, President Obama will make mistakes, will depart from his principles, disappoint us at times. Hopefully (and we all should hope this), at times he will also show wisdom and strength. To everything there is a season, and this, regardless of your politics, is a time to rejoice for what we have moved beyond. God may bless these United States, but sometimes the grace comes not from God, but from ourselves as we transcend our weaknesses and heal those wounds that hurt the most. John McCain and Barack Obama, in different ways, both exemplify what is best about America, and it is only because of them both that this moment can be real and whole and deep in a way we have too long awaited. I love election day. I get more excited for it than I do for most holidays, in fact-- right now I can hardly sit still, when I should be writing my reply brief on the certiorari petition in Spears II. 1) Obama offers the hope of positive changes in criminal law. Yes, I care deeply about criminal law, and to me this is a crucial issue. Obama is much more likely to allow and even promote reforms in the areas of sentencing and prosecutorial priorities. McCain has shown no interest in this area, other than the vague promise to be "tough on crime." 2) Obama offers a better hope to repair our relations with the rest of the world. We have some work to do on that front, and Obama offers a cleaner break from the Bush Administration that created many of our problems. A big strike against McCain on this count, for me, is that someday, sometime, Sarah Palin could become the president and be in charge of our relations with the rest of the world. At this point, she is barely qualified to be a tourist, much less an international leader. 3) Obama offers a better financial outlook for the country. I have discussed this here before. I think that Obama is essentially a cautious person, and the campaign has shown him to be exceptionally disciplined. I think he is more likely to be like Clinton, who successfully limited the growth in government spending, than like George W. Bush, who did not. John McCain might be as frugal, but also seems driven to impose further tax cuts, which would drive the deficit up and create even greater income inequality. According to Baylor's school paper, the Lariat, things kind of got out of hand at homecoming this year. The police chief, in fact, compared the students to European soccer fans (with all the violence but none of the patience for 0-0 ties). As I understand it, there is a tradition that an "eternal flame" is kept in memory of basketball players who died in a 1927 bus accident. At homecoming, the flame is guarded by some freshman. That all sounds fine, but here comes the weird part. It seems that the tradition is that other students then try to extinguish the eternal flame. They take this very seriously, apparently-- two people, including a police officer, were hospitalized this year. Now, here's the even weirder part. This year, the flame was attacked by a large group of students wearing hockey masks. Really? Goalie masks? Look, I'm from Michigan, and it is really easy to get a hockey mask there, but in Texas? Where did these guys go to buy a large batch of goalie masks? Or, God forbid, did they make them themselves? Back in the day, of course, goalies didn't even wear masks. Check out Rangers goalie Gump Worsely in the photo above-- on the ground, skates flying by, puck coming in at 100 mph, and he is down there without a mask or even a helmet. Now that... that was crazy. Razorite "B" sent along this photo, wondering if the guy in the blue coat on McCain's campaign plane is IPLawGuy. I think probably not, but I'll let him weigh in on that. The photo was taken from McCain's daughter's blog. From what I see on there, the McCains seem to be in pretty good spirits given the long odds they are said to be facing. Last night, I gave an interview for channel 10 in my front yard, since they wanted to talk during "The Simpsons" and were willing to come over. The reporter, Eli Ross, did an excellent job, despite the weird location. 1) Prof. Serr has a talk show on CNN, but it is scheduled for only ten minutes. In the episode I am watching, he has invited a professor from another school who has a bunch of bad ideas. At the end of the segment, Prof. Serr says, "Well, I wish I hadn't invited this guy." 2) I'm working on a case at a courthouse in Tennessee. Going into the hallway during a break, I see Joe Hoelscher coming into the lobby wearing a suit and... a wedding veil. (For what it's worth, he isn't getting married-- it is case-related) I ask him what is going on, and he says it is "a long story." 3) I come down for breakfast and find that there is a crudely built 6-foot tall robot eating all my Cheerios. He's messy, too-- like the Cookie Monster, he just chews stuff but doesn't swallow, so the Cheerios just go spilling all over the place. I would welcome any interpretations. There are no rules that say someone can only be considered a 'good' person if they are a person of faith. You can in fact be a very spiritual person and have nothing to do with organized religion. I think I agree with both of her ideas-- that one can be a good person even without faith, and that many spiritual people are not a part of an organized religion. First, on the question of whether there are "good" people who are not religious, I would have to say there are such people, and I know some of them. One of them, in my own family, lives a life more consistent with Christian principles than I do. He lives simply and humbly by choice in a way I do not, and has dedicated much of his vocation and energy to helping the poor, the oppressed, and those who have been abused. Even if I accept the definition of being "good" as living life by Christ's precepts (something that, of course, assumes my beliefs, not his), he is very good-- even much better than I am. On the second idea, I would also accept that there are spiritual people who are not a part of an organized religion. Some of them, of course, are not spiritual in the same way that I am, and others may have many of my beliefs. With them, I would agree on one central thing: That I and they do not need a hierarchy (other than that of God & man) to structure our spiritual beings. I would probably differ from them, though, in practice, in that I need community to nurture my own spirit, even when I conflict with the beliefs of some or most of the people in that community. Shirley Nagel passed out candy Friday -- but only to those who shared her support for Republican presidential candidate John McCain and running mate Sarah Palin. A sign was posted Friday outside Nagel's house and it served notice to all trick-or-treaters, according to Channel 2/WJBK-TV. It read: "No handouts for Obama supporters, liars, tricksters or kids of supporters." On Saturday afternoon, the sign was no longer there. Nagel told WJBK-TV that "Obama's scary." When asked about children who'd been turned away empty-handed and crying, she said: "Oh well. Everybody has a choice." Thanks to Tyd for sending this GP news along, and Christine for the video tip (and RFDIII for sending me the singing hockey mom).